Gorgeous full, flowy skirt made to order from high quality durable polyester, that drapes like a dream. 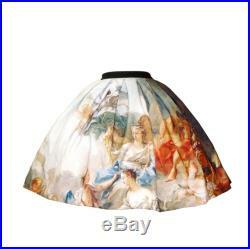 The skirt's original print features one of four remastered old master's series release paintings - francois boucher's "marriage of cupid and psyche". The simple waisted skirt is super full (almost 3 meters hem). It's custom printed locally via sublimation method, that ensures long lasting, vivid colors. Back of the skirt is shirred to add comfort. Invisible side zipper, hook and eye closure. Measurements: your waist measurement skirt lengths:- short version: 56 cm (21,6 inches)- long version (like on model): 66 cm (25,6 inches)ask if you need more than one skirt notes:- listing does not include petticoat, just the skirt- all designs are printed locally on 100% polyester. Colors are vivid and not prone to fading or washing out. Skirts can be machine washed on low settings (as polyester). Should be drip-dried or dried flat.